Bison power Scott Vercaigne goes for a spike against a strong Wesmen defence during the 3rd place match at the 51st Classic tournament, on Saturday at the Dr. David F. Anderson Gymnasium. The 10th-ranked Bison men’s volleyball team worked off those extra Christmas calories this past weekend at the 51st annual Wesmen Classic. Normally reserved for basketball, this year the University of Winnipeg hosted eight volleyball programs from across Canada to compete in a non-conference tournament. 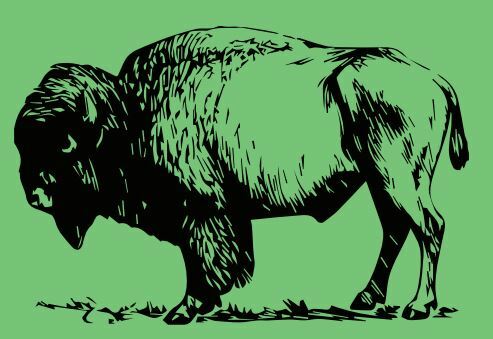 The Bison men’s basketball team have won the last two iterations of the basketball tournament. 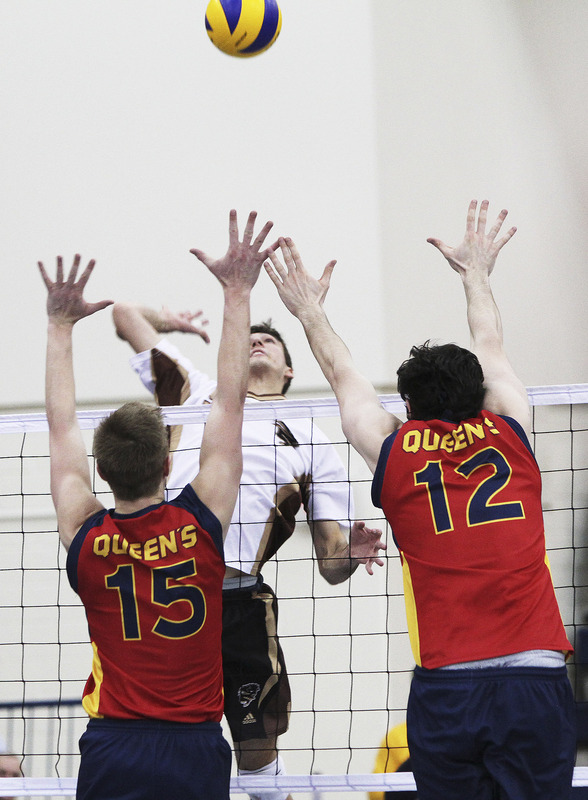 The Bison men’s volleyball team were unable to follow in the footsteps of their basketball brethren, finishing fourth. 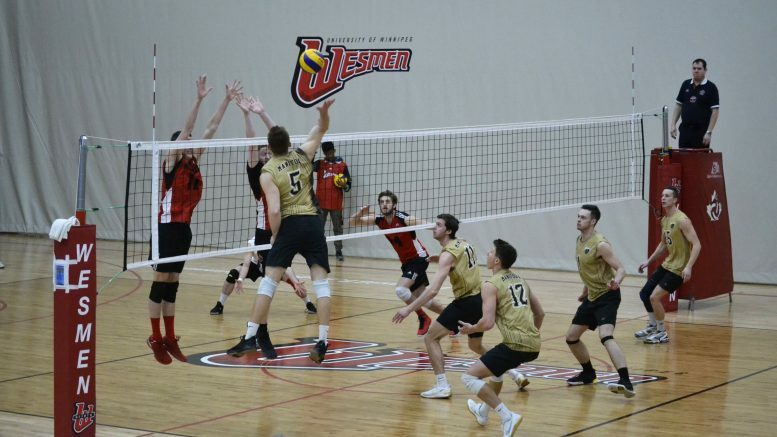 The Wesmen Classic title stayed in Manitoba, however, with the University of Brandon Bobcats beating the Laval University Rouge et Or in three sets. Manitoba opened the tourney with a 3-1 win over the Western University Mustangs. On the second day of competition, the Bisons took out crosstown rivals the Winnipeg Wesmen in a nailbiting 3-2 match. In the second game of the day for the herd, the Bisons fell 3-1 to the University of New Brunswick Varsity Reds. In semifinal action, the Bisons fell to the Laval University Rouge et Or 3-1. In the bronze medal game, the Wesmen got the last laugh, dispatching the Bisons in three straight sets to hand the Bisons a fourth place finish. Bison fifth-year left side hitter Adam DeJonckheere was named a tournament all star. Manitoba will have a chance to exact some revenge on the Wesmen in a couple weeks, on Jan. 18 for the 27th annual Duckworth Challenge at the Dr. David F. Anderson Gymnasium at the U of W.
The Bison women’s basketball team headed to Montreal to play a pair of games against the Université du Québec à Montréal Citadins. The Bisons lost both games, falling 82-65 and 82-75, respectively. Taylor Randall had a combined 37 points over the pair of games. The Bison men’s basketball team was out east at Ryerson University in Toronto for a mini training camp in preparation for the second half of the season.